Sarah Nader- snader@shawmedia.com Andrew Zinke (left) and Bill Prim give their opening statements during the McHenry County Sheriff Candidates Debate sponsored by the League of Women Voters and the Northwest Herald at McHenry County College Tuesday, February 25, 2014. 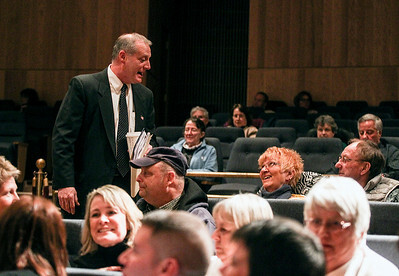 Sarah Nader- snader@shawmedia.com McHenry County Sheriff candidate Bill Prim greets people before the McHenry County Sheriff Candidates Debate sponsored by the League of Women Voters and the Northwest Herald at McHenry County College Tuesday, February 25, 2014. 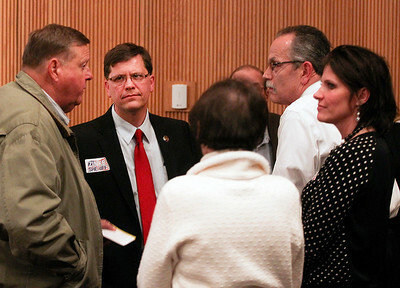 Sarah Nader- snader@shawmedia.com McHenry County Sheriff candidate Andrew Zinke (center) greets people before the McHenry County Sheriff Candidates Debate sponsored by the League of Women Voters and the Northwest Herald at McHenry County College Tuesday, February 25, 2014. 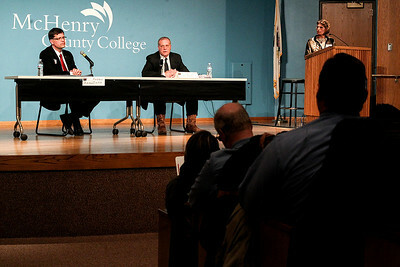 Andrew Zinke (left) and Bill Prim give their opening statements during the McHenry County Sheriff Candidates Debate sponsored by the League of Women Voters and the Northwest Herald at McHenry County College Tuesday, February 25, 2014.